May 7th, 2008: Sunny and Warm, Water Temp 72* and Clear. Picked clients up early and went to catch bait. Set up on a main lake flat pulling big Gizzards. 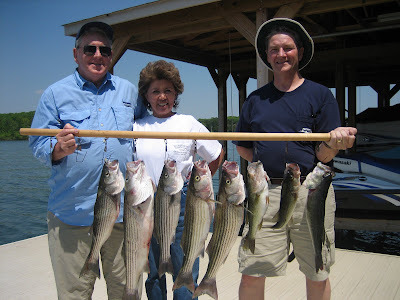 Immediately the Stripers started boiling the baits but would not hit them. I put out some smaller Herring but they would not get looked at so we continued to pull the gizzards but only boated 2 fish by 9am. Found a large school of Stripers on a deep flat and put downlines on them but they refused to hit our offerings. After working a couple of large school with no success I made another move and worked another school with limited success. We had 30 hits today catching 8 Stripers, 3 Bass and a couple Cats.